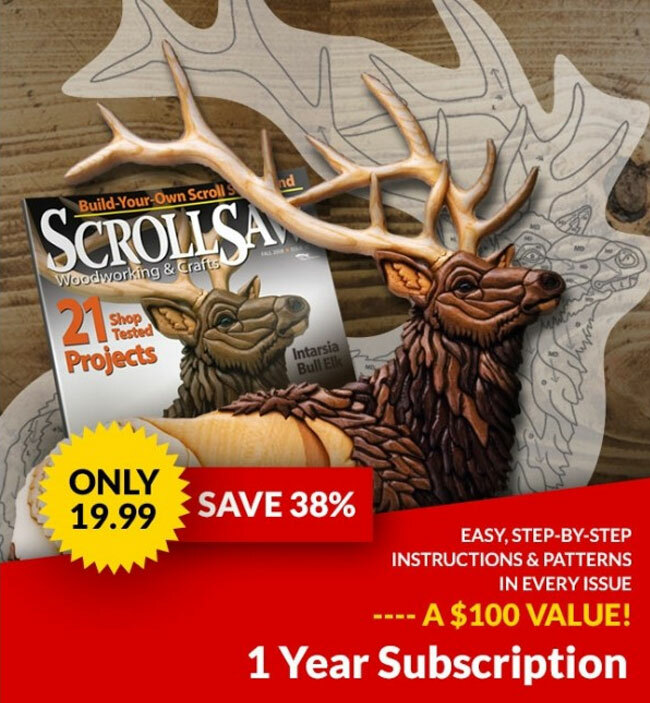 Excalibur has totally redesigned the scroll saw with their new EX21. 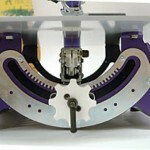 The biggest change is in the mechanism to change the cutting angle. 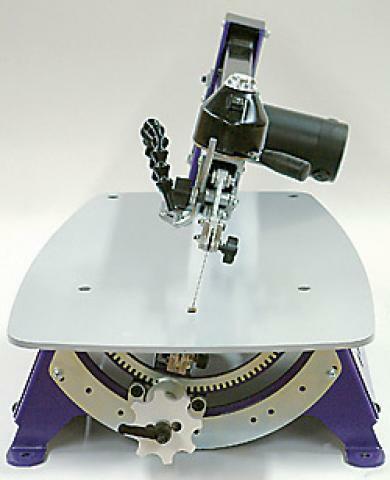 Instead of tilting the saw table to the right or the left, the saw arm tilts to the right or the left. 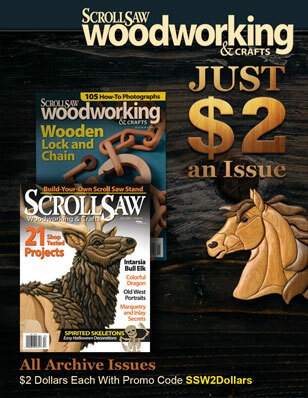 I invited author and professional scroller Mike Lewis over to put the saw through its paces. Mike’s first comment was “it looks like a tank.” Both the saw table and base are made of plate-steel and finished with a baked on powder-coating for extra durability. When you look under the table you will see a large hand wheel—about the size of your fist—with a locking lever in the middle. Loosen the lock and rotate the hand wheel and the head tilts. The huge, ¼”-thick plate-steel table stays flat, while the head, upper and lower arms, and motor tilt to the left or the right. Two large gears—one in the front and one in the back—work together with a small gear attached to the hand wheel to effortlessly rotate the entire assembly. The assembly can be locked making it possible to set the table to any angle. Holes have been drilled into the large gear, allowing you to click into place and quickly set the assembly to a common angle. The power switch, speed control knob, and tension adjustment lever are all located on the front of the upper arm, resulting in easy access for the operator. The upper arm lifts up and locks in the up position for easy blade threading. The air blower, rocker arms and blade clamps have not changed. The convenience of toolless blade changing has always been a favorite feature on the Excalibur. As an added convenience, the machine has built in blade holders on each side of the base to accommodate round blade tubes. I took a couple test cuts to just play around and see how the saw would perform and then glued down a pattern and tried to cut accurately. The blade tracked beautifully and I was able to cut the part in my usual manor with no control difficulties. 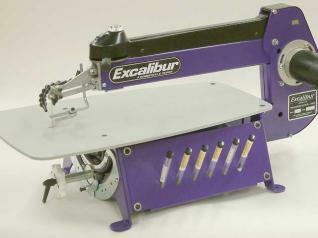 All in all, the Excalibur folks did a fantastic job with this saw. The EX-21 is very user friendly, smooth, and very usable. 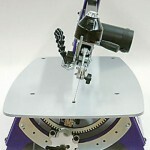 Contact Excalibur at 800-357-4118 for a dealer near you or log onto www.seyco.com. Motor: 120V, 60Hz , 1.3 amp constant torque permanent magnet motor. Blade Stroke: ¾” Accepts only plain end blades. (*Note: Most manufacturers refer to the clearance of a saw as its capacity—and using that theory, the Excalibur’s capacity would be 2¼”.) With head tilted to 45°, the maximum clearance would be 1¼”.